See feedback below from guests who have stayed at Stream House B&B Rye. “Stream House is absolutely beautiful as are the grounds and the hosts Sandra and Steve. It’s the perfect place to stay. The bath was amazing in the poppy room, we will definitely be going back. The breakfast was lovely as was everything”. “We have just enjoyed three wonderful days in this fantastic B&B. The Poppy room was extremely comfortable with its super Kingsize bed and luxurious en-suite. Steve and Sandra were very friendly and helpful and breakfast was delicious. A beautiful house in a beautiful setting. We thoroughly recommend it”. “We spent 3 days at Stream House. It is set in lovely grounds and the accommodation was excellent and immaculate. The owners were friendly and took the trouble to provide very useful information which made our stay even more enjoyable”. “Having stayed a number of times at Stream House I can confirm the five Star rating. The Poppy Room is large and Roomy with views to the side and back of the house, the bathroom overlooks the front and the fish pond. The whole house is tastefully decorated and the owners help in anyway that they can”. “The full English breakfast is fantastic so you have to look out for your waste line. On a nice evening sitting by the fish pond and letting the day pass in a beautiful garden. Who wants more?”. Family from Germany. “Well, what can I say? This was my fourth stay at ‘Stream House’ and as we walked down the path to our hostess, Sandra, my first words were ‘feels like we’ve never been away!’. Stream House has the kind of country charm that draws you in and makes you feel at home. Sandra gives a warm welcome with tea/coffee and cake but gives you space to relax and settle into your surroundings”. “We stayed in the Poppy room, as per previous stays. And since our last visit it has been redecorated in beautifully tranquil colours, with a luxurious feel. I must also point out that both the room and ensuite bathroom are spotless – sparkling clean! Out of the windows are views of the stream and the sprawling garden. You really do feel a million miles away from every day hustle and bustle”. “Breakfast was an enjoyable affair with locally sourced ingredients and plenty of variety. You won’t go hungry! On this occasion we were not able to make the set breakfast time, due to early travel requirements. But Sandra happily obliged when we asked if it was possible to have an earlier sitting. It was really no trouble for which we were hugely grateful”. “If you like beautiful scenery and classic, stylish surroundings, this is the place for you. Attention to detail is superb and the location is ideal for many possible day trips. Can’t recommend highly enough – already looking forward to my next visit”. Jaimme from Selby, North Yorkshire. “Steve & Sandra were perfect hosts.. If you want to get away from it all then this is the perfect place to book! Beautiful house, stunning grounds. Amazing wildlife & birds, from Badgers to Bats, chiffchaff to jays. This is the perfect rural location for you!”. 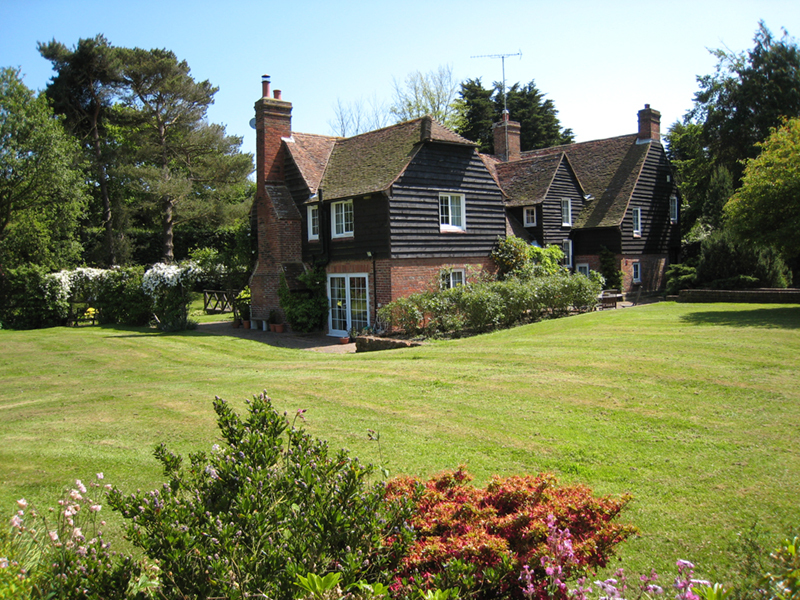 Kelly S.
“I highly recommend staying at Stream House if you are visiting East Sussex and want top quality accommodation! My partner and I have just returned from staying two nights and were made to feel very welcome by Steve and Sandra who were really friendly and helpful hosts. Their home is absolutely lovely, warm and comfortable and surrounded by a huge and pretty garden. Our cosy bedroom (Bluebell Room) overlooked a babbling stream at the back and was very attractively furnished with a super-comfortable double bed. Everything had been thought of in the room. Including a nice selection of teas, biscuits, bathrobes, hairdryer and luggage rack. Also, a window blind and curtains (if you like it extra dark at night!) and a fresh bottle of water each day. The ensuite bathroom was spacious with separate shower and free-standing bath. Very posh toiletries were provided as well! Everywhere was immaculately clean but not in a way that you didn’t feel you could relax and make yourself at home. It was so peaceful that we came back for an afternoon nap after a great 10 mile walk from the doorstep. Breakfast was delicious both mornings and we didn’t need to re-fuel until we got home! Thank you Steve and Sandra for a really relaxing and pleasant stay”. Couple from Worcester. “The four of us were made to feel very welcomed by Sandra when we arrived. Great location, lovely house and very comfortable rooms with all amenities. First class breakfasts and lovely garden”. “We took in a couple of local walks, one over the fields to the cliffs produced excellent views of both coast and countryside. Would have no hesitation in recommending this B and B. Nigel T from Guildford, Surrey”. “The house is beautifully furnished and decorated and no details are missed. One of my favourite parts to the Poppy room was the bathroom which has a beautiful freestanding bath. The bed was large and immensely comfortable, and the shower and toiletries were very luxurious”. “Breakfast was delicious and freshly prepared, with plenty of choice. Sandra was very attentive and made sure we had everything we wanted. We had a stroll around the vast garden. It was very scenic and peaceful, with a beautiful stream running through it”. “Stream House was a brilliant place to visit for a weekend break. I highly recommend B&B Rye to anyone who values comfort, tasteful interiors and unique charm”. Vie B. Stream House B&B Rye is a special place to stay. Click HERE to see what visitors have to say about their stay at Stream House B&B Rye.